ABSTRACT: Performers and editors of early music have always been conscious of the need to provide accidental inflections not present in the sources themselves. In reviewing some of the work of recent scholars within the context of the writings of established Medieval and Renaissance theorists, I try to explore a way of resolving what seems to be an incompatibility between our own understanding of consonance and interval, and the Renaissance theorists’ understanding and evaluation of mode. In 1984 and 1987 articles were published respectively by Margaret Bent(1) and Daniel Zager(2) both of which undertook a reappraisal of Renaissance attitudes to the theory and practice of consonance and dissonance. Both authors proposed solutions to particular examples selected as case studies, the former admitting that her conclusions concerning a section taken from Josquin’s Ave Maria might be considered “provocative.” The purpose of this essay is to review some of these conclusions, and to verify their validity against the testimonies of some prominent Renaissance theorists and musicians. Of three examples studied by Margaret Bent, two have subsequently been reviewed by Karol Berger,(3) and Bent’s proposals strongly refuted. At the heart of both examples (a mass section by Obrecht, and the fa mous ‘duo’ by Willaert) is the issue of pitch conceptualization and frequency stability. According to Bent, the fact that applied diatonic ficta caused the Obrecht piece to begin on F and end on F was of little if any consequence for the singers because they (unlike us) were not limited by a sense of ‘frequency stability’ and merely needed to progress through the piece step by step. According to Berger, however, singers could only progress through the piece by locating each step of the gamut as a pitch relative to the previous step. It was therefore necessary for them not only to know that the note at the end indeed was a different pitch from that at the beginning, but also to know exactly by how much. This crucial element of pitch conceptualization is especially applicable (in Berger’s view) to a singer’s understanding of the tenor part of Willaert’s ‘duo’ whose final note (E) is intended to sound a perfect octave below the note d in the upper voice. The singer, when reaching the final E-fa (inevitably pitched a whole tone lower than the original recta E-la), is compelled by the actuality of performance not only to know that the two pitches are very different, but also to be aware of the exact amount of difference. In short, the purpose of the gamut (and the Guidonian hand) is to maintain pitch stability, not to repudiate it. The remaining example studied by Bent—a portion of the Josquin motet Ave Maria—led her to make a proposal that has remained unchallenged during its twelve years of currency. The passage concerned is attached as the Example 1. Beginning at measure 44, this passage undergoes a considerable amount of ficta activity stemming from the simultaneous occurrence in measure 48 of B in the bass and F in the tenor. By the accepted rules of consonance, the bass B must be flattened to B in order to provide a perfect consonance with the tenor. This, according to Bent, sets off a chain reaction over the next four measures so that E s and A s become introduced in order to avert the presence of vertical diminished fifths (i.e. the B will call for the E , and then the E will require the A ). Any explanation either in favor of, or against, her proposal will need to address the following conceptual issues: a) frequency stability; b) modal stability; c) consonance evaluation. With regard to a) frequency stability, there is no difficulty. Although Bent does not accept the relevance of such a notion, it is perfectly possible for singers who do to follow her notation and to move through the relevant steps required to arrive at the cadence on the pitch indicated. The proposal in itself does not, therefore, prescribe or presume a lack of pitch stability. A major difficulty arises however with regard to b) modal stability. Since Bent (“Diatonic ficta,” pages 45–47) regards modal coherence as a close relative of pitch stability (against which she argues), it is her view that this ficta activity in no way disturbs the mode. Zager in his article (“From the Singer’s Point of View . . . ,” page 11) also argued against the notion of “modal purity” as having been a compositional precondition for fifteenth- and sixteenth-century music. Before discussing what can be inferred from Zager’s casual term “modal purity,” the essential difficulty which emerges is that the views suggested by both Bent and Zager with regard to the importance or otherwise of “mode” are contradicted by the highest Renaissance authorities, in particular Glareanus. 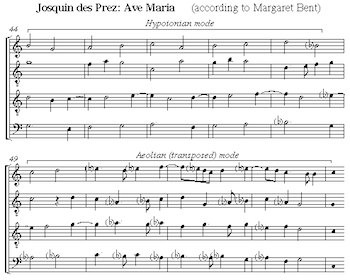 Josquin’s Ave Maria follows precisely the criteria required of compositions written in Mode 12 (Hypoionian). Its range, as described by Glareanus, is from G to g and its final is on c. Furthermore, its cadence points concur exactly with those prescribed for this mode by Zarlino,(9) being restricted to his regular cadences on C, E and G. However, the approach to the C cadence proposed by Bent admits pitches so alien to the hypoionian mode as to be inconsistent with the description of Glareanus which, we must remember, accorded this piece the singular attribute of being written “according to this [hypoionian] mode . . . and without removing the harmony from its base.” This now brings into discussion c) consonance evaluation. Since it is impossible to render the Josquin passage in any way other than that proposed by Bent without failing to eliminate all diminished fifths otherwise occurring between notes of the upper voices (such an elimination being her prime motive), it must follow that Glareanus viewed a proper performance of this motet as one in which some diminished fifths were present. Only by this means would it have been possible to remain faithful to the mode on account of the actual notes Josquin composed in the particular combination chosen by him. It is necessary, therefore, to question Bent’s assumption that all such combinations needed to be eliminated, and to arrive at a credible rationale for the use of such intervals within a polyphonic texture. In the Supplement to Pietro Aaron’s Toscanello(10) the author, in objecting to the practice of partial signatures, states that composers use a flat in the lower part in order to remove the imperfect fifth between B mi and F fa ut. His objection to the practice is twofold: first the signature imposes a global effect which changes the natural ordering of the gamut whereas such dissonances could have been corrected by the local use of accidentals, and second the global imposition of the low B is now at variance with the higher voices whose lack of the B yields superfluous octaves with the bass. Although Aaron’s point is one of asking composers to provide such signatures in all voices, he has nonetheless raised a crucial question: why did composers give priority to the eradication of imperfect fifths occurring between the bass and an upper voice by inserting a flat only in the lower voice (or voices)? After all, the same latent danger must have afflicted the upper voices. Another manifestation of bass-precedence affects the employment of the perfect fourth. This interval was regarded as a dissonance if used alone,(11) but as a consonance if a fifth sounded beneath it in the bass. (12) From an acoustic point of view this is hardly surprising: when used alone the interval yields the mathematical ratio 4:3 (upper note:lower note). If a fifth is placed beneath it, however, the lowest note will remove the dissonance by completely changing the audible acoustic parameters: although the upper two notes still have a ratio of 4:3, this is subjugated by the lowest note because now the effect is a consonance where the middle note has a ratio of 3:2 (with the lowest note) and simultaneously the highest note will have the ratio 2:1 (again with the lowest note). The simpler the ratio, the more consonant is the interval. Perhaps more immediately relevant to the present essay is Aaron’s painstaking review of a list of published compositions in which individual praise is given to the composers concerned for clearly inserting the flat sign at points where singers would otherwise fall into the trap of producing a diminished instead of a perfect fifth. (13) Twenty-one compositions are cited, seven of which are selected from Petrucci’s Odhecaton A. The remarkable fact about these references is that all but one citation specify an accidental affecting only the bass voice which otherwise would cause a dissonance with an upper voice. The only item where Aaron singles out a voice other than the bass is Orto’s motet Ave Maria where an E in the tenor is mentioned. Since, however, the bass is silent at this point, this tenor assumes the harmonic fundamental in its stead. So every example given is one where the lowest-sounding voice of the texture is adjusted to achieve consonance with an upper voice or voices. Bonnie Blackburn’s statement implies that in composed music all “improper dissonances” deemed (by whatever criteria) that exist anywhere between any two parts must be removed. Yet we know that this cannot be the case because the perfect fourth, which was considered by Tinctoris to be harshly dissonant (see note 10 above), was routinely admitted into composed music when covered by a voice sounding a fifth below (see note 11 above). The difference here is that while all the voices according to Blackburn’s surmise are mutually exclusive of all “improper dissonance,” the same voices are according to Tinctoris mutually inclusive of the laws of consonance. 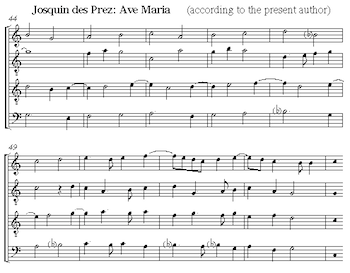 Although this may, at first, seem to amount to the same thing, it is actually very different and will materially affect one’s whole view of consonance and dissonance treatment as it is perceived to arise in examples like Josquin’s Ave Maria. For one thing, Blackburn’s view will agree with Bent’s so that no diminished fifths will be permitted to exist anywhere in Josquin’s texture (not because they combine poorly with the other voices, but because they have the temerity to exist at all). Yet we know from Tinctoris himself that the use of diminished fifths in the upper voices of composed music was widespread,(20) and Karol Berger has devoted a lot of work in explaining such accepted usage (see note 17 above). The most crucial difference between the statements of Blackburn and Tinctoris, however, is that Blackburn seems to deny the need to view the existence of intervals “in relation to all the others” as well as “in relation to themselves” (which is what is prescribed by Tinctoris). In other words, if a singer happens to sound the note B above a voice singing G a tenth lower, and simultaneously a third singer happens to sing the note E in between, Blackburn’s assumption is that both singers of the upper voices will instantly cease to be aware of the consonance between their own notes and the bottom pitch because (independently from this two-fold consonance) there would exist a dissonance between themselves which somehow overrides and disqualifies their consonance with the lowest voice. According to Tinctoris, however, the situation would be quite different: while, at the moment of collision, the two higher singers would be aware of a dissonance between them, their acceptance or rejection of this dissonance (i.e. whether or not they decided that it is an “improper dissonance”) would only occur as a result of their evaluation of the overall effect of this juxtaposition with the lowest voice. This is precisely why, indeed, there is a distinction between the dissonant and the consonant perfect fourth. The judgment as to whether such dissonances are “improper dissonances” (Blackburn) must therefore be arrived at not pragmatically with reference to the two upper voices alone, but with regard to “all the others” (Tinctoris) as well. In this regard Tinctoris tells us that the majority of composers were happy, taking into account the overall effect of such a combination, to use the diminished fifth in this way as a means of approaching a perfect consonance. Returning therefore to the Josquin example, we must now find a way of remaining faithful to Glareanus’ view of modal fidelity while also ensuring that perfect concords are not placed in jeopardy by improper dissonances. Example 2. Josquin, Ave Maria (Wibberley’s version). 1. Margaret Bent, “Diatonic ficta,” in Early Music History 4 (Cambridge: Cambridge University Press, 1984), 1–48. 2. Daniel Zager, “From the Singer’s Point of View: A Case Study in Hexachordal Solmization as a Guide to Musica Recta and Musica Ficta in Fifteenth-Century Vocal Music,” in Current Musicology 43 (1987), 7–21. 3. Karol Berger, Musica ficta: Theories of Accidental Inflections in Vocal Polyphony from Marchetto da Padova to Gioseffo Zarlino (Cambridge: Cambridge University Press, 1987), 43–8. 4. Heinrich Glareanus, Dodecachordon, A Facsimile of the 1547 Basel Edition (New York: Broude Brothers, 1967). See also Clement A. Miller, “Dodecachordon: Translation, Transcription and Commentary” (2 vols.) in Musicological Studie s and Documents 6 (Rome: American Institute of Musicology, 1965). 5. While most other composers are represented by from between 1 and 6 pieces, Josquin is represented by no fewer than 29. We can be sure also from the way in which Glareanus eulogizes over Josquin’s virtues in Book III, Chapter XXVI that Glareanus was intimately acquainted with the music of this “genius” and “chief of singers.” To have made a careful selection of 29 pieces which exemplified particular attributes relevant to Glareanus’s discussion of Mode was evidently not a difficult task fo r him. 8. Zager, page 11. If one were to claim that “tonal purity” was not a precondition for the composition of seventeenth- and eighteenth-century music, a comparable ambiguity would be perpetrated. To be sure, no composer from this era would compose anything without a clear tonal base, but it is unlikely that this base could be adequately articulated only by a succession of notes restricted to those of the diatonic scale (major or minor). Only by moving away from, and back to the home key is the tonality effectively articulated, and this creates a diversity of cadence positioning. It also admits notes outside the diatonic series which serve to form essential links between one cadence position and another. This means that while a piece may be described as being written in a key, not all of it will remain in that key. All movement around the prevailing key center will be carefully balanced to maintain a tonal coherence designed to emphasize the home key. In a similar manner Renaissance music composed in a particular mode will cadence upon accepted degrees of the scale other than the final, and this will bring into being the use of notes outside the diatonic notes of that mode either as raised leading notes to the new cadences, or as sharpened or flattened notes required for consonance purposes in the approach to new cadence points. Renaissance musicians, however, were quite clear as to which particular degrees of the scale were appropriate cadence points for particular modes, and which were not. 9. Gioseffo Zarlino, On the Modes, trans. Vered Cohen, ed. Claude V. Palisca 1983, (New Haven: Yale University Press, 1983), 86. 10. Pietro Aaron, Toscanello in Music, trans. Peter Bergquist (Colorado Springs: Colorado College Music Press, Translations: no. 4, 1970), 3, 23–24. 14. Helen Hewitt & Isabel Pope, Petrucci: Harmonice Musices Odhecaton A, (Cambridge, Massachusetts: The Mediaeval Academy of America, 1942), 219. 15. Since consonance and dissonance are determined by the ratio of the lesser to the greater (e.g. the octave ratio of 2:1 providing a simpler, hence more consonant relationship than that of the perfect fourth which is 4:3), it must logically follow that when a low G is placed beneath the interval E–B two new consonances are suddenly brought into being. These are the intervals GG–E (a major sixth) and GG–B (a minor third plus an octave). Dissonance is, of course, still present between the upper two notes (just as it is with the perfect fourth placed a fifth above the bass), but the manner of perception is tempered by the added consonances which arise from the presence of the lowest note. 16. Using a convenient modern manner of description, a perfect consonance can be likened to a chord in root position. Throughout most of the Renaissance, the paradigmatic form was that of three notes where the middle one was a perfect fifth higher than the lowest, and the highest formed an octave with the lowest. Although the two upper notes formed only a fourth (which was a dissonance), each formed a perfect consonance with the lowest. In a similar manner, an imperfect consonance could be viewed as a chord of the first inversion (major, minor or diminished). In any such chord, each upper voice (irrespective of the presence or absence of dissonance perceived to be in existence between the two upper notes) will form an imperfect consonance (i.e. a third or sixth) with the lowest. 17. For a more thorough discussion of the prohibition and use of the tritone and diminished fifth, see Berger, 70–154. 18. Bonnie Blackburn, “On Compositional Process in the Fifteenth Century,” JAMS 40 (1987), 283. 23. Zarlino, Le Istitutioni harmoniche, trans. Guy Marco and Claude Palisca (New Haven: Yale University Press, 1968), 65. 24. I have used the words ‘natural’, ‘sharp’ and ‘flat’ only because the accidental signs themselves, which Zarlino uses in the extract above, do not have ASCII equivalents that can be used in the presentational format of this essay. 25. It is my view that, in general, the importance of mode has been underrated in recent times. Perhaps the view has been that writers like Zarlino and Glareanus, in attempting to codify and package their own humanistic views on the music of their time, merely imposed these upon the works of composers who, possibly, may have had little or no actual interest in such dogma. I have two problems with this view. First, composers like Josquin were surely no less humanistic in their outlook than commentators like Zarlino and Glareanus. And second, it seems to me highly inconsistent, on the one hand, to trawl through the many complicated paragraphs of such writers in order to tease out useful hints on technical matters like non-harmonic relations (and to construct elaborate theories upon these findings) while, on the other hand, clear technical and aesthetic comments upon modes and their use offered by the same writers are conveniently overlooked. Karol Berger (Musica Ficta . . . ) places an important emphasis upon this aspect and notes (page 58) concerning the question of accidental signatures that “The answer to this question is simple, predictable, and supported by massive evidence . . . one used an accidental signature when one wanted to transpose a melody to a different location from the one it would have if notated without the signature and to retain all of its intervals unchanged, that is, to retain its mode. This is why one is justified in calling it a ‘key signature’.” This view contrasts significantly with the position of Margaret Bent (“Musica Recta and Musica Ficta,” Musica Disciplina 26 , 73–100) and Andrew Hughes (“Manuscript Accidentals: Ficta in Focus 1350–1450,” Musicological Studies and Documents 27 [Rome: American Institute of Musicology 1972]) who considered the function of accidental signatures as being to transpose the Guidonian Hand. For evidence offered against the position of Bent and Hughes, see Berger, 64–5. Margaret Bent, “Diatonic ficta,” in Early Music History 4 (Cambridge: Cambridge University Press, 1984), 1–48. Daniel Zager, “From the Singer’s Point of View: A Case Study in Hexachordal Solmization as a Guide to Musica Recta and Musica Ficta in Fifteenth-Century Vocal Music,” in Current Musicology 43 (1987), 7–21. Karol Berger, Musica ficta: Theories of Accidental Inflections in Vocal Polyphony from Marchetto da Padova to Gioseffo Zarlino (Cambridge: Cambridge University Press, 1987), 43–8. Heinrich Glareanus, Dodecachordon, A Facsimile of the 1547 Basel Edition (New York: Broude Brothers, 1967). See also Clement A. Miller, “Dodecachordon: Translation, Transcription and Commentary” (2 vols.) in Musicological Studie s and Documents 6 (Rome: American Institute of Musicology, 1965). While most other composers are represented by from between 1 and 6 pieces, Josquin is represented by no fewer than 29. We can be sure also from the way in which Glareanus eulogizes over Josquin’s virtues in Book III, Chapter XXVI that Glareanus was intimately acquainted with the music of this “genius” and “chief of singers.” To have made a careful selection of 29 pieces which exemplified particular attributes relevant to Glareanus’s discussion of Mode was evidently not a difficult task fo r him. Zager, page 11. If one were to claim that “tonal purity” was not a precondition for the composition of seventeenth- and eighteenth-century music, a comparable ambiguity would be perpetrated. To be sure, no composer from this era would compose anything without a clear tonal base, but it is unlikely that this base could be adequately articulated only by a succession of notes restricted to those of the diatonic scale (major or minor). Only by moving away from, and back to the home key is the tonality effectively articulated, and this creates a diversity of cadence positioning. It also admits notes outside the diatonic series which serve to form essential links between one cadence position and another. This means that while a piece may be described as being written in a key, not all of it will remain in that key. All movement around the prevailing key center will be carefully balanced to maintain a tonal coherence designed to emphasize the home key. In a similar manner Renaissance music composed in a particular mode will cadence upon accepted degrees of the scale other than the final, and this will bring into being the use of notes outside the diatonic notes of that mode either as raised leading notes to the new cadences, or as sharpened or flattened notes required for consonance purposes in the approach to new cadence points. Renaissance musicians, however, were quite clear as to which particular degrees of the scale were appropriate cadence points for particular modes, and which were not. Gioseffo Zarlino, On the Modes, trans. Vered Cohen, ed. Claude V. Palisca 1983, (New Haven: Yale University Press, 1983), 86. Pietro Aaron, Toscanello in Music, trans. Peter Bergquist (Colorado Springs: Colorado College Music Press, Translations: no. 4, 1970), 3, 23–24. Helen Hewitt & Isabel Pope, Petrucci: Harmonice Musices Odhecaton A, (Cambridge, Massachusetts: The Mediaeval Academy of America, 1942), 219. Since consonance and dissonance are determined by the ratio of the lesser to the greater (e.g. the octave ratio of 2:1 providing a simpler, hence more consonant relationship than that of the perfect fourth which is 4:3), it must logically follow that when a low G is placed beneath the interval E–B two new consonances are suddenly brought into being. These are the intervals GG–E (a major sixth) and GG–B (a minor third plus an octave). Dissonance is, of course, still present between the upper two notes (just as it is with the perfect fourth placed a fifth above the bass), but the manner of perception is tempered by the added consonances which arise from the presence of the lowest note. Using a convenient modern manner of description, a perfect consonance can be likened to a chord in root position. Throughout most of the Renaissance, the paradigmatic form was that of three notes where the middle one was a perfect fifth higher than the lowest, and the highest formed an octave with the lowest. Although the two upper notes formed only a fourth (which was a dissonance), each formed a perfect consonance with the lowest. In a similar manner, an imperfect consonance could be viewed as a chord of the first inversion (major, minor or diminished). In any such chord, each upper voice (irrespective of the presence or absence of dissonance perceived to be in existence between the two upper notes) will form an imperfect consonance (i.e. a third or sixth) with the lowest. For a more thorough discussion of the prohibition and use of the tritone and diminished fifth, see Berger, 70–154. Bonnie Blackburn, “On Compositional Process in the Fifteenth Century,” JAMS 40 (1987), 283. Zarlino, Le Istitutioni harmoniche, trans. Guy Marco and Claude Palisca (New Haven: Yale University Press, 1968), 65. I have used the words ‘natural’, ‘sharp’ and ‘flat’ only because the accidental signs themselves, which Zarlino uses in the extract above, do not have ASCII equivalents that can be used in the presentational format of this essay. It is my view that, in general, the importance of mode has been underrated in recent times. Perhaps the view has been that writers like Zarlino and Glareanus, in attempting to codify and package their own humanistic views on the music of their time, merely imposed these upon the works of composers who, possibly, may have had little or no actual interest in such dogma. I have two problems with this view. First, composers like Josquin were surely no less humanistic in their outlook than commentators like Zarlino and Glareanus. And second, it seems to me highly inconsistent, on the one hand, to trawl through the many complicated paragraphs of such writers in order to tease out useful hints on technical matters like non-harmonic relations (and to construct elaborate theories upon these findings) while, on the other hand, clear technical and aesthetic comments upon modes and their use offered by the same writers are conveniently overlooked. Karol Berger (Musica Ficta . . . ) places an important emphasis upon this aspect and notes (page 58) concerning the question of accidental signatures that “The answer to this question is simple, predictable, and supported by massive evidence . . . one used an accidental signature when one wanted to transpose a melody to a different location from the one it would have if notated without the signature and to retain all of its intervals unchanged, that is, to retain its mode. This is why one is justified in calling it a ‘key signature’.” This view contrasts significantly with the position of Margaret Bent (“Musica Recta and Musica Ficta,” Musica Disciplina 26 , 73–100) and Andrew Hughes (“Manuscript Accidentals: Ficta in Focus 1350–1450,” Musicological Studies and Documents 27 [Rome: American Institute of Musicology 1972]) who considered the function of accidental signatures as being to transpose the Guidonian Hand. For evidence offered against the position of Bent and Hughes, see Berger, 64–5.